Every year on Holy Week, we go to Batangas to be with my side of the family. 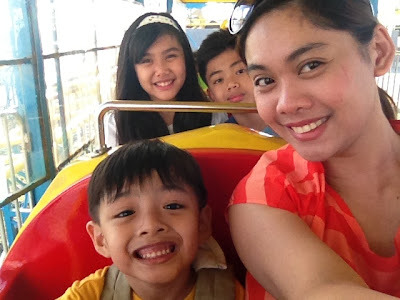 This year before heading home to my province, we decided to meet with the family and try the newly opened amusement park in Tagaytay City. Tagaytay Sky Ranch was opened just last month by SM. 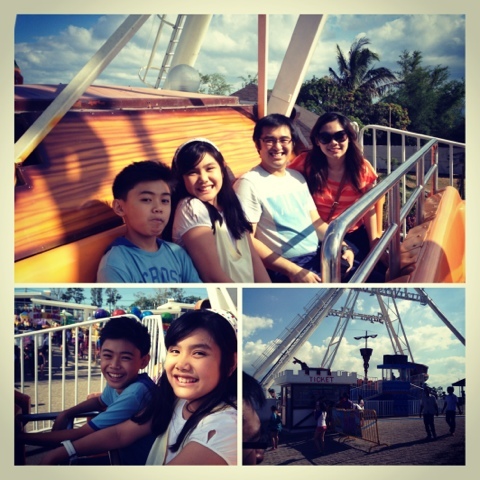 From the outside you already get to see the Tagaytay Eye or Sky Eye, the country's largest ferris wheel to date. It's the park's main attraction. To get in, you have to pay the entrance fee of P50. You have to pay for the individual rides once you get inside if you want to try them. 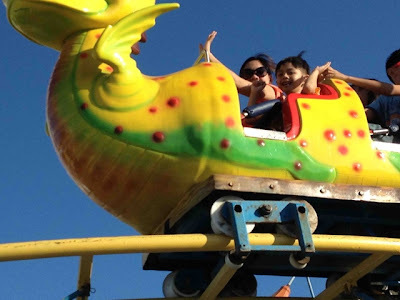 The rides cost P50-150. They don't have ride-all-you-can passes yet. 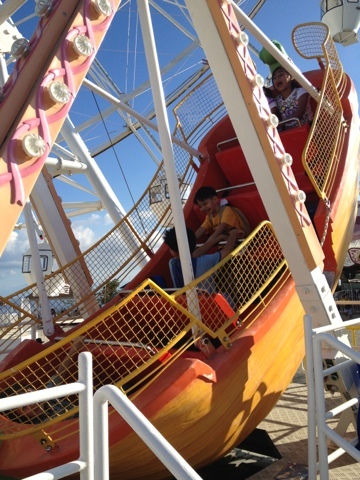 The first ride that we went on was the Super Viking. It's similar to Anchors Away in Enchanted Kingdom. I do think the ship here in Sky Ranch swings higher though. Aside from the thrill that you get from each swing, an added bonus is you get to have an amazing view of the Taal Lake once the ship reaches its highest point. But, that is if you can keep your eyes open. Henry and my little sibs, had a tour of the whole park by taking the Express Train. This ride has the second longest line in the park next to the Sky Eye. Henry wanted to ride the Super Viking, but, due to the height limit he wasn't allowed to yet. (And I wouldn't let him anyway.) Good thing there was the Little Viking. 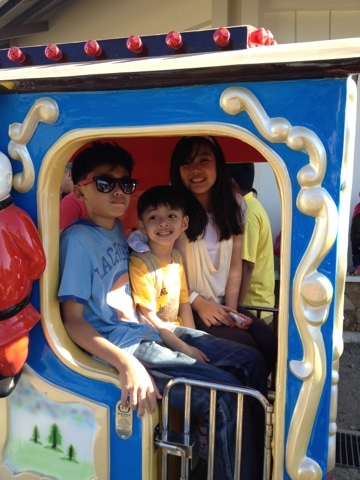 My little brother went with him, being the good tito that he is. And it looked like they both had a great time on it. Next to the Little Viking was the Nessi Coaster, the only roller coaster inside the park for now. (they're building a bigger one right next to it.) As soon as Henry saw it, he ran and went to line up for it. He's never been on a roller coaster before so I was a bit apprehensive at first. 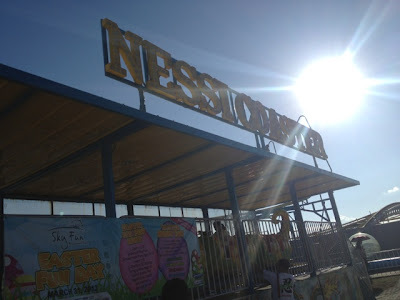 But as soon as the attendant said that he can ride it, I immediately bought tickets for us. The little boy was so brave, we even got on the first cart. He surprised me when he raised him arms while the roller coaster was speeding its downhill tracks. After this ride, we were all famished. There are no restaurants yet in Sky Ranch and only a few food stalls were present which means it was time to go. We left the place without going on the Sky Eye. Sayang! 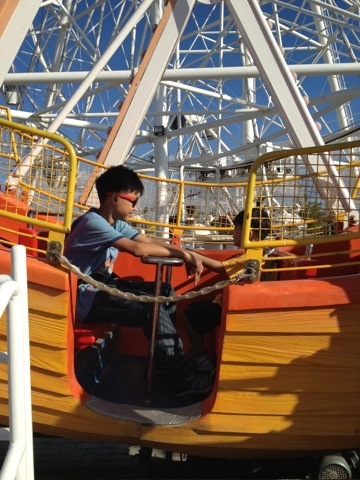 I wanted to see the view from the ferris wheel, but I'm sure that there's still a next time. There are also other rides that we haven't been in yet so for sure we are coming back. Sky Ranch is located along Aguinaldo Highway near the Taal Vista Hotel. For more info, visit their Facebook page. What about you? Where have you been this summer? Any nice places that you can recommend for families with little kids? P.S.My blog is nominated in Voiceboks.com's Top 10 Mom Blogs of 2013. If you like it, I hope you can vote for me by clicking on the "Like" button on my Voiceboks Page. Thanks in advance.